Ok, this is what happens when you get too hyped. You get a little disappointed. OK, I wasn’t exactly disappointed by this episode, but I was expecting more. OK, apart from those two little disappointments, it was a very interesting episode nonetheless. Not much “happened” but a lot of character development. Ah! I knew it! I knew the Brotherhood without Banners hadn’t become bad guys, and I’m very glad the assholes who killed the community where Sandor Clegane had taken refuge got their comeuppance. Also, excited to have Beric Dondarion and Thoros of Myr back. When they were first introduced I found these two guys fascinating and I was pretty sad they disappeared quite quickly from the show. I hope they stick around more this time. And the good news is that The Hound is teaming up with them (despite the fact that they seriously lack chickens). That’s quite a trio, if you’re asking me. An interesting thing is that Beric and Thoros seem to be the only two people south of the Twins who care about the White Walkers. Is the Hound finally about to become a “hero”. It’d better, because I’m not too happy that his trip north is going to postpone the Cleganebowl. One may complain that “nothing happened”. I feel that many things happened, but to only one character, namely Jaime. This Riverrun campaign showed us that Jaime is finally becoming a leader of men. His evolution continues. Sure he still only cares about Cersei (well, more on that in a few lines), but he proved that he could lead an army, and more important, that he could solve such a sticky situation without a single drop of blood being shed. Well, except Blackfish’s, but it was more suicide than anything else. Jaime is still not a good guy though. He would have had no qualms killing Edmure or his son. To our knowledge, he didn’t allow the Tully army to go North (maybe they will go anyway? Not sure. What is Edmure’s fate? Is he free to go? Not sure.) But he proved that he’s not the jerk that he once was. His scene with Brienne was great. There is love, real love between those two. Will they ever be able to acknowledge it and express it? Unfortunately I’m afraid not. Will they ever see each other again? It was also good to have some Podrick and Bronn interaction. So Varys is returning to Westeros. Where is he going? I feel that the only place where he could go without getting in danger (he’s considered to be the one who allowed Tyrion to escape, right?) is Dorne. 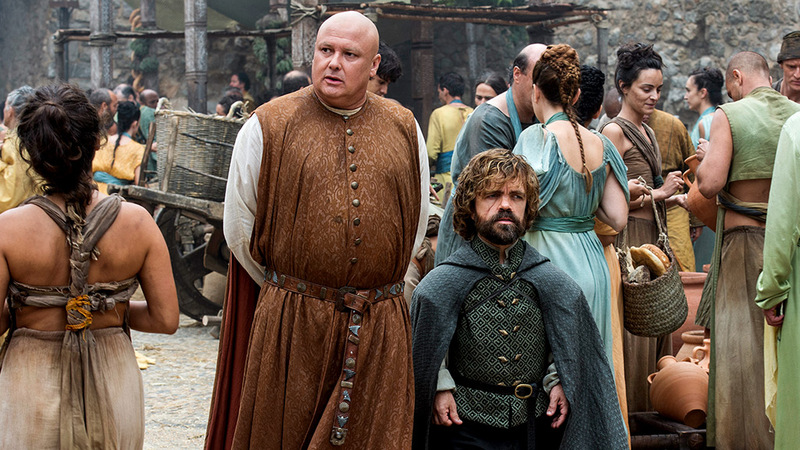 I’m sad to have Tyrion and Varys split ways. They’re probably my two favorite characters and they finally had become good friends. Why do I have the feeling that they will never see each other again. The only good thing that I hope will come from that is that Varys and Littlefinger will hopefully cross paths again. Their exchanges used to be the best. Cute little scene with Tyrion trying to get Missandei and Greyworm drunk – with some success – until Masters spoil the fun, betray their word and attack Meereen. They are proving that they can’t be trusted once again, but they are also proving that Daenerys and friends have stayed there for far to long, time to move on. Luckily Daenerys returns, and with Drogon and all the Dothraki (and two more dragons that will hopefully see the light of the day again soon) maybe they can save Meereen and finally move on. The Faith Militant are now in the Red Keep, but they’re getting a bit ahead of themselves when they think they can control Cersei. I was hoping for the Mountain to kill a few more. Oh well. The problem is that they waste no time getting back at Cersei when her own son betrays her by forbidding trial by combats. She can’t rely on the Mountain to save herself. Same thing goes for Loras who’s in a big trouble too without a trial by combat. This is the moment one starts feeling bad for Cersei and almost want to root for her when suddenly we remember what she’s capable of after her little conversation with Qyburn. What are they talking about? What rumor has Qyburn confirmed and much more than confirmed? Why am I thinking this is about lots and lots of wildfire remaining in the underbelly of King’s Landing? Will she inspire herself from the Mad King for her next move? I’m really starting to think so. How will Jaime react to that? So much for all the speculations last week. What we saw happening was pretty much what happened. Arya got careless and got ambushed. I have to admit I’m a bit disappointed in that scene from last week then. First, yes, I think that while we sometimes forget that Arya is still only a teenager, I don’t think she’d be that careless right after betraying the Faceless Men. Then the injury caused by the Waif looked more serious than it actually was… This week it makes more sense and what happened was quite satisfying if one can ignore that scene from the previous week. And in the end, Arya indeed had a trap for the Waif, and it worked. The epilogue was pretty interesting. Why does Jaqen finally think she’s ready to join? No idea and it doesn’t matter. His reaction to Arya’s stance was pretty interesting though, as if he was very proud of her. It’s clear that he’s very fond of her, and he probably thinks that it would have been a waste if Arya had become a faceless woman… So in a sense, Jaqen is proud and happy to have failed “enlisting” her. I wonder if we’ll see him again. Next week: Bastardbowl!!! It promises to be a crazy episode full of action and resolution. OK, that’s all for today, as usual, I’ll come back tomorrow to edit a few things, if only typos, because the night is dark and full of errors. And as usual, if you like what you’ve read, do not hesitate to share on your social media of choice. It was one my favourite episode either… So, you see….